‘The Unknown Soldier’ is a stunning contribution to the soundtrack of our past as we approach the centenary of the Armistive, signed November 11 1918. In the autumn of last year, Richard made a pilgrimage to the battlefields of the Somme and the cemeteries and memorials that commemorate the longest and bloodiest battle of the First World War. This experience, a hundred years on from the end of the 141-day battle, sparked an urgent desire to pay homage in music to the memory of the fallen, the lost, the many, and to help to keep the flame of remembrance burning. As he walked the fields and explored the remains of 1916’s trenches and mine craters, his mind was haunted by two great tunes, The Last Post and Abide with Me, that have always been linked with the Great War and its tragic slaughter. Gradually, the two melodies became intertwined in his thinking and he decided he would create a short hymn for orchestra and chorus that would fuse them into a single piece, dedicated to the men who fought ‘the war to end wars’. 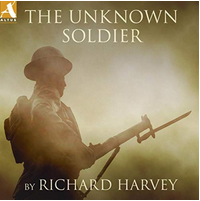 The Unknown Soldier by Richard Harvey – out now 11.10.18 on various platforms: https://westonemusicgroup.lnk.to/TUS.